I had thought about starting this blog for 5 years before I finally bit the bullet and did it. Ever since I learned to cook, I have enjoyed cooking for people. I don’t think I necessarily was born with a gift for knowing how to cook, but I was definitely blessed with the gift of service. Step inside my home for 5 minutes and I will have your feet propped up and a glass of iced tea or hot coffee and a snack in your hand, asking you about your day and for you to stay for dinner. I like to think I learned this from my grandmother. Growing up, I remember her being the same way. (and she still is) She is a lot better housekeeper than I am, but that is a topic for another day. So I knew this recipe was special from the get go. I also could tell by the short ingredients list that it was easy. Maybe the easiest mac and cheese, I have ever made that didn’t come from a box. While I knew the recipe would be delicious, what I was not prepared for, was it being the best mac and cheese my family has EVER had, and probably the only mac and cheese I will ever make again. With only 4 ingredients, (and no flour), this mac and cheese is almost custard-like, with unbelievable flavor. I am so honored that Mrs. Helen Salter chose to share her Grandma Mayes’ Mac & Cheese with my family and yours. I can’t wait for you to give it a try! Butter a 2 quart casserole dish. Save out 3 slices of cheese and set aside. Roughly chop the rest of the cheese with a knife and place in bottom of casserole dish. Boil noodles al dente. Drain and stir hot noodles in with chopped up cheese. Whisk together eggs and milk. Pour over noodles and cheese. Place the reserved cheese slices on top of the casserole. Bake uncovered at 350 degrees for 45 minutes to 1 hour. Keep an eye on the top of the casserole, and if the cheese starts getting brown before your casserole is done, lightly place a piece of foil on top to keep it from burning. After 45 minutes, test with a knife to check for doneness, let it cook a few minutes longer if needed. Enjoy! Looks yummy Brandi! I’m so glad that you started blogging so I had the chance to meet you. I also think that it’s a strong statement of respect when a reader sends a beloved family recipe to you unsolicited. It means that they truly trust and care for you! I can’t believe this is only 4 ingredients! It looks wonderful and I can’t wait to try it! I have to try this! 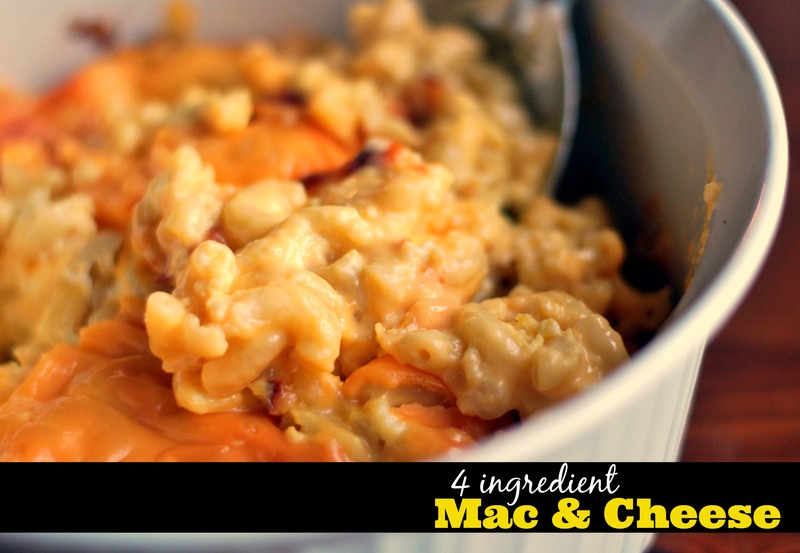 I’m on the lookout for a good mac n cheese recipe, and this could be simpler! I’m always nervous about making a roux, etc. I’ll try this one! Where can I buy the the packaged Deli Deluxe Sharp Cheddar Slices (no substitutions)? I don’t think I’ve ever seen that in Wisconsin. I got mine at walmart! How many ounces of cheese is in that package? Which company makes the cheese? Kraft? Sargento? How many servings does this recipe make? Kraft makes the Deli Deluxe Sharp Cheddar Singles. I just edited my post to add the brand name. The packages are 8 oz in size. I am terrible at guessing serving sizes, but I would guess 4 to 6 maybe??? Thanks for your questions! Do you break up the cheese slices into bits when you mix them with the hot macaroni? Or is it more layered in the baking dish? I roughly chopped the cheese slices up with a knife. I will edit that in the instructions to make it more clear! Thanks for your question! Thanks. I want to try this. It’s similar in many ways to how my mother made hers. Sounds delicious. Have bookmarked this to try some time after I find a good sale on the cheese slices. Thanks for sharing this with us. Hello, I am wondering if your cheese is the slightly thicker slices like real deli cheese or the package of slices that are more like velveeta? Kraft has both and I want to get this right the first time. Sounds so yummy!